A 10-man robbery gang in 3 cars recently shot at an armoured security van carrying huge amount of money in Limpopo South Africa. The robbers dramatically shot out the tyres of the Cash Solutions vehicle before using explosives to blow the roof off completely. 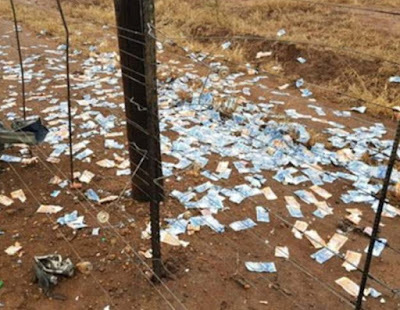 The force of the explosion forced some cash kept inside boxes to scatter into the air, forming a money rain. Motorists were seen helping themselves as money practically fell from the sky during the robbery that lasted for about 30 minutes. The robbers reportedly escaped with huge amount of cash before police arrived.